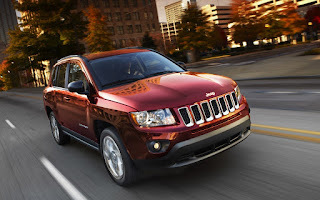 The 2013 Compass features a rugged yet refined look, inspired by the Grand Cherokee. Its exterior styling cues incorporate the classic Jeep® seven-slot grille with Chrome surrounds. The Compass features soft-touch points for added comfort and as an added available convenience, the steering wheel includes fingertip control of audio and handsfree phone Uconnect Voice Command with Bluetooth. The SUV features all of the same features listed with the Patriot, but it also comes with the same 17-inch all-terrain tires. Come by and see for yourself and take a test drive here at Hendrick Chrysler Jeep!